When the opportunity to visit Shanghai again via Lufthansa and its new Premium Economy product arose it was clearly a trip not to be missed. True it was just a few days after getting back from Hanoi (see BTN 5 October) but a comparison of the two great Far Eastern cities could be made. Comparing the airlines is not required. They don’t compete on direct routes. The plan was outbound Friday with arrival Shanghai first thing Saturday morning. That day, Sunday and Monday in China’s largest city and back in the evening with arrival in the UK capital at the crack of dawn Tuesday morning. A busy few days. Lufthansa operates four times weekdaily from London City to Frankfurt and travellers can choose the most suitable of the two Shanghai flights for their connection. The new Premium Economy products nestle perfectly into the front cabin of the A380 lower deck, an area a number of airlines use for First Class. It is completely self-contained with its own galley, two restrooms, 38 seats 2+4+2 each 18in wide and with a pitch of 38in. Economy is 3+4+3. Lounge access can be bought and boarding is by the lower front door where provided by the airport. BTN 21 September reported on the product, suffice to say that it works seamlessly on the A380, but less so with the A340, where it is just four rows 2+3+2 and some plastic screening before the standard Economy layout. The good news about the A340 is that Business Class offers the same flat seats as on the A380, 2+2+2, with the same catering and cabin service. Lufthansa offers wi-fi on all its long-haul services and from early summer 2016, will be the first network airline in Europe to install broadband on board its short- and medium-haul flights. But don’t expect a connection over China. Wi-fi is prohibited and it does not get much better when on the ground. If you are on Gmail or use Facebook forget it. Talk to your hotel reception. The ever clever Chinese have found their way around the official ban. Our host in Shanghai for what was a two-night stay, coupled with an intensive tours programme, was the Puli Hotel and Spa, 5-star boutique luxury, part of the Urban Resort Concept. On arrival at the hotel we were offered a 90-minute massage in the heath resort, an ideal way of recovering from an 11-hour flight, a perfect arrival programme. Hotel guests only, even for the 25m indoor pool and keep fit area. Sited close to the Shanghai Exhibition Centre and Temple, The Puli sits directory over a metro station in the centre of the downtown area, adjacent to the French Concession city quarter. It is a much more lively area than Pudong in the evening with 50 restaurants reputed to be within a few hundred yards of the hotel. For retail therapy souls there are plenty of places to use your plastic money. What is truly amazing is how quiet the hotel is even in the private garden where we took afternoon tea. A corner Deluxe King Suite was priced at £478 including complimentary stocked mini-bar, wi-fi and unlimited use of health club, sauna, steam room and indoor infinity pool. The charge includes a full breakfast and whilst there is no executive lounge as such snacks and beverages are part of the package taken in the ground floor lounge area. The standard size rooms, priced accordingly, are very comfortable. The Jing An restaurant provides contemporary French cuisine. 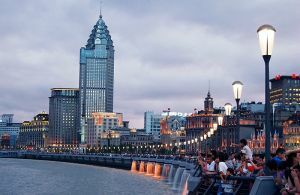 The Bund, sitting on the Huangpu River, is one of the world’s great promenades, classic 1920 colonial buildings turned into diners of distinction and packed with expats and young middle class Chinese. Think of London’s Embankment on New Year’s Eve. It is like that every weekend with numerous restaurants as a backdrop. We were hosted the first night one by the Mercato, at Number Three The Bund, the Union Building, a remarkable structure itself dating from 1916 and now hosting six top quality restaurants, one per floor. It is topped out by the Pop Bar, on a glorious autumn evening a wonderful way to view the Grand Hyatt, Shangri-La, and the yet to be completed Shanghai Tower. Number Three The Bund ought to be replicated in London but a suitable structure, used or disused, is not that easy to find. In any event Mercato celebrity chef Jean Georges Vongerichten charts new territory for his dining empire with his first ever Italian concept. Simple pleasures like woodfire oven pizzas, burrata cheese with sea salt or homemade rigatoni with meatballs dominate the menu. Perfect after a long flight. It was back to The Bund the next night too, this time Hakkasan’s, also in London, and close by the famous (Fairmont) Peace Hotel, once Sassoon House, and renamed during the Communist Revolution of 1929. Hakkasan served us cod with Champagne and Chinese honey, crispy duck salad and jasmine tea smoked Wagyu tenderloin. Delightful. When it is a short press trip the best organisers try to pack in as much as possible allowing some flexibility for those who want to do their own thing. The big difference between Shanghai and Beijing is that the authorities for the most part have allowed the older buildings to be retained. It makes for real atmosphere. 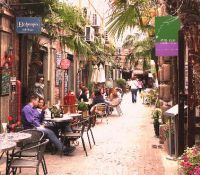 Our Sunday morning walk was into Tianzifang is a labyrinth of narrow streets and alleyways off Taikang Road, an arts and crafts enclave that has developed from a renovated residential area in the French Concession area. Coffee shops and trendy art studios abound and for some it is time for serious bargain hunting. The Sunday lunch at The Puli includes roast beef but no Yorkshire pudding. 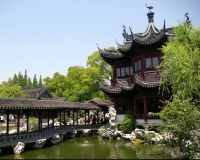 After what was an overgenerous buffet what better way to stroll it off than a stroll through Yu Garden, 5 acres of lakes, bridges and historic buildings dating from 1559. The gardens suffered damage numerous times during the 19th century and during the First Opium War, the British army used the Huxinting Teahouse as a base of operations. Yu Garden became a national monument in 1982. Monday it was up early again for what was for the highlight of the whole trip, the Dumpling Walk, a serious commercial enterprise by UnTour, taking about three hours and covering just over one mile. We were warned not to touch breakfast and visited five eating places finishing up at with an interactive cooking class and eating one’s own produce. European and North American Chinese speaking guides offered the expert interface. For this one the price was £55. UnTour provide a whole series of culinary tours and also the Glutton Guide providing knowledge on regional cuisine, street food plus bar and nightlife information. There was just enough time for a walk, through yet another pretty park sitting next to the hotel and past the 400-year old Buddhist JIngAn Temple, still in use today. The easy to manage metro was just one stop to People’s Square, a real hub of activity but not enough time to even venture into the Shanghai Museum, a highlight of previous visits. Let’s face it. Shanghai is a very large city with a population suggested of 24m, that is well over twice the size of London and goes back just as far. It is impossible to even scratch the surface in three days which has to include journey recovery time. But do put it on your wish list. However long you can afford to spend in China’s biggest conurbation it is well worth it. In truth you cannot compare Hanoi and Shanghai. Yes they are both Communist cities but the Vietnamese capital is much smaller than the trading centre of China. And Shanghai has been pedestrianised in parts with cars banned in the popular tourist areas on a Sunday. In Hanoi the cycles rule. Find a couple of weeks. Try both.